Sidney Park CME Church was founded in 1886 and has been at this site since 1889. 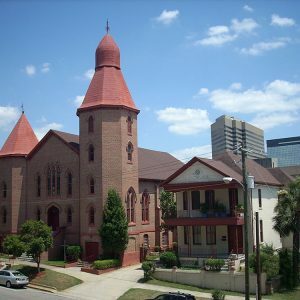 It grew out of a dispute among members of Bethel AME Church, who left that congregation and applied to join the Colored Methodist Episcopal Church. The congregation acquired this site in 1886 and built its first sanctuary, a frame building, in 1889. That church burned by 1892. This Gothic Revival brick church, built in 1893, was constructed by members who provided materials and labor. In the 1930s many members joined the NAACP and the church later hosted many meetings during the Civil Rights Movement.